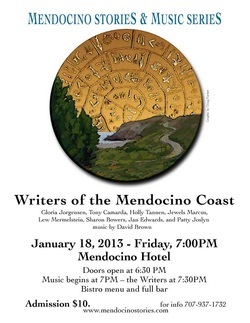 Thanks to the writers and artists who participated in the collaboration with the Artists' Coop of Mendocino. On October 17th, sixteen members of the Writers of the Mendocino Coast read from a piece crafted to respond to an artist's work or crafted to provide inspiration for an artist, whose work was projected onto a screen. We are grateful to the Mendocino Hotel for use of the Garden Room. Poetry Series December 20; Open mic solstice reading & party, live jazz accompaniment. Doors open at 7 pm, reading at 7:30. Potluck contributions welcome. Dinner & drinks available. College of the Redwoods is offering English 33, Creative Writing Fiction for Spring 2013 on Monday evenings 6-9pm with 3.0 credit or P/NP option. This class will focus on the short story foundations of Plot, Character, Dia-logue, Setting, Voice, Point of View, and most importantly, Editing for Publi-cation. All levels, ages, and genres are welcome. Class #033303. Instructor: Katherine Brown. Class runs January 14th through May 6th. The Mendocino Coast Writers Conference debut issue of Noyo River Review is now available. In it are winning entries from the MCWC 2012 writing contests. You can access the journal via a link from the www.mcwc.org home page, or go directly to www.noyoriverreview.org to download a free PDF for viewing online, or purchase a handsomely printed bound copy on high quality paper. Kudos to the production team: Susan Bono (editor), Katy Pye and Nona Smith (asst. editors), Fran Schwartz and Henri Bensussen (proofreading), Janet Ashford (cover), and Tony Eppstein (design, layout and web interface). Thanks also to local artists Suzi Marquess Long, Sandy Oppenheimer and Linda MacDonald, who contributed their lovely artwork. Katy Pye, Nona Smith, Fran Schwartz, Henri Bensussen, and Janet Ashford are also members of the Writers of the Mendocino Coast branch of the California Writers Club. 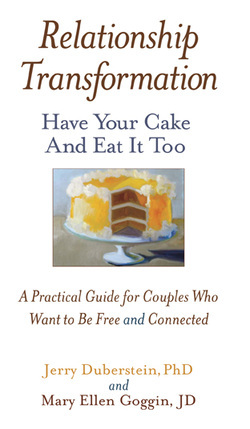 Member Mary Ellen Goggin and Jerry Duberstein published a book, Relationship Transformation, Have Your Cake and Eat it Too, this year. The husband and wife team show readers how to honor their separate selves while building joyful lifelong relationships. Mining the gold from Duberstein's forty years as a therapist, and Goggin’s 35 years as a relationship coach, life coach, educator, lawyer, and mediator, RELATIONSHIP TRANSFORMATION provides the tools for couples to gain awareness of what drives them, what holds them back, and how to re-envision their relationship. Meet the authors Friday February 1st, 6:30 pm at Gallery Bookshop. Each month we'll set aside time for two members to read for 3 minutes (375 to 500 words.) To participate, put your name on a slip of our paper into the basket. A name will be drawn at the start of the evening, and another at the end. Please time your reading before the event to ensure it's within the limit. 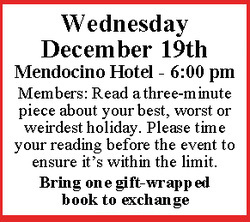 The Writers of the Mendocino Coast meet in the Mendocino Hotel at 6:00 pm on the third Wednesday of every month (except November because it's the night before Thanksgiving day.) We host speakers, workshops, open mics and other yet to be discovered events and activities. The California Writers Club fosters professionalism in writing and promotes networking of writers with the writing community. All genres and writing styles are supported. In order to provide an environment where members can obtain critique of their efforts, a clearing house has been established. Please send a description of your writing experience and genre, the frequency of meeting you would like, and other information you consider pertinent. We will connect you with other members. Member Stasha Ginsburg published her book, Girltruth from the Belly, this year. Baba Yaga says, “What will you turn up with, bones or butter?" After escaping from her small town problems, our heroine meets the Devil in Moscow. 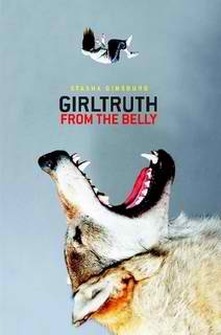 Myth and cold hard truth guide her out of the belly of the wolf. Teenage chaos and cultural awakenings are woven with Little Red Riding Hood, Vasalisa the Brave, and many more. This coming of age adventure reads like a Russian nesting doll, opening story upon story: from an isolated Midwestern town into the heart of the Russian transition from Communism to Democracy.